Vasterlanggatan is one of the street names in the area of ​​Gamla Stan. Just like Drottninggatan, hallway Vasterlanggatan also filled with a variety of restaurants, shops and cafes, is famous as the place Vasterlanggatan shopping among tourists. I wonder what their reason many tourists who spend money there, but all the souvenirs offered price is much more expensive than Drottninggatan. Vasterlanggatan walking means walking in a small hallway crowded with tourists. Unlike the Drottninggatan wider and wider, almost Vasterlanggatan like most roads in Gamla Stan yait narrow and old. Almost all typical medieval buildings that adorn Vasterlanggatan now turned into souvenir shops, restaurants and cafes. Such as the temptation to shop or have lunch in an old building that is still well groomed too attractive to pass up begi tu only. Maybe it was that caused the tourists do not mind spending their money in Vasterlanggatan. They are willing to pay dearly to enjoy the medieval atmosphere like that. Vasterlanggatan narrow enough so that some of the restaurants on this street could not put tables and chairs outside. As compensation, they open a wide window of the restaurant and let anyone passing by to see their guests who were eating lunch. Such sights as well as inviting passersby to come in and try the lunch menu that day. The sweet aroma of freshly baked kua Vasterlanggatan filled the air, in front of the storefront display various forms of tempting cakes and seduce my heart to come and buy. Vasterlanggatan atmosphere is lively Drottninggatan can not match. Street artists is seen in a few places, but they were more calm in the show action. Vasterlanggatan atmosphere filled with chatter in various languages, the color of the old buildings of Gamla Stan, souvenir shops, and rome festive cake and coffee hung in the air. That’s all that captivated the attention of the tourists and the main attraction Vasterlanggatan. Actually, this place is just one alley in Gamla Stan. 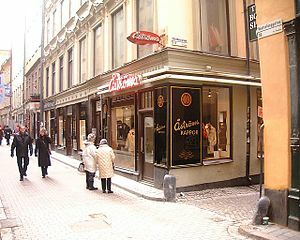 However, because it has the smallest predicate alley in Gamla Stan, the Marten Trotzigs Grand became famous. Marten Trotzigs Grand became the cover of Vasterlanggatan, its location is strategic enough so that visitors Vasterlanggatan definitely see and come to this place, so the more famous Grand Trotzigs Marten’s. For Asian people in general, it seems that alley there is nothing exciting, just a narrow alley with a winding staircase to the next street. However, there are many tourists who come to admire it dang Marten Trotzigs Grand. Until now I still do not understand the well with what they admire there. I was so busy, to take pictures in front and at the Marten Trotzigs Gran just have to wait.